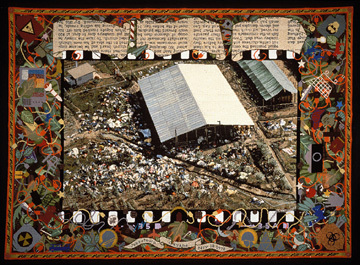 Laura Baird began to make her tapestry, The Jonestown Carpet, (see top photo above with details below it) several years before the publication of Grisilda Pollock's The Subversive Stitch Embroidery and the making of the Feminine, which presents a theory about femininity, art and embroidery. Baird's work does not directly highlight issues of the history of art by women; rather, her carpet embodies an attitude to art making which would have been inconceivable before the contemporary rise of the women's movement and a concomitant reexamination of traditional women's labour in the art of the 1960s and 1970s. 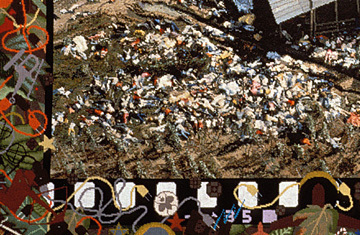 From the beginning, as evidenced in the choice of subject matter and also in the actual labour done on it in the context of Baird's life as a professional artist, the Jonestown Carpet is evidence of Baird's assumption that this long and slow technique was perfectly valid as advanced contemporary art practice. Baird had a way cleared for her by 1960s conceptual artists who often structured their work as a task or as a laborious working process. Within NSCAD, one thinks of both Garry Kennedy and Eric Cameron's layer paintings; the obsessive match-tick weavings of Richards Jardin; and carpenter beading pictures by Gerald Ferguson, all of which put tedious labour at the centre of an art project. The Jonestown Carpet is not only an act of historical recovery of women's work, but also a ten-year-long meditation on the deaths of 900 religious cultists in Jonestown Guyana in 1978. John Armstrong and Sarah Quinton, in the 1994 catalogue Textiles, that is to say... mention the branch Dividian mass suicides as a parallel to Jonestown, and I feel compelled to mention the even more recent Solar Temple massacre, and even the Rwandan tragedy. For me and others who have seen the work, The Jonestown Carpet has become a touchstone for the subject of religious cult death, and a memorial to the victims of mass killing. The work resonates as an emblem of the millenarian fantasies of all cult members. People familiar with the Jonestown Carpet immediately think of it in the same way they might unconsciously hum the tune to a pop song about rain whenever they are caught in a sudden downpour. With great patience, Baird went through many productive trials with the Jonestown Carpet, taking out large portions which did not satisfy her and replacing them; during its making Baird ripped up almost as much fibre as she stitched into the Jonestown carpet. The obsessiveness of the labour in this work of art has a metaphoric weight which is a legacy of 1960s process art, but as much as Baird's investment of time in her work recalls the work of conceptual artists such as On Kawara, Daniel Buren and others who fascinated many NSCAD faculty members during Baird's years at the College, one also notes her work's evocation of such loaded and uncharacteristically "conceptual" resonances with, for example, the Homeric myth of Penelope at her loom. As Penelope sat at her loom awaiting Odysseus' return, we recall, she rebuffed suitors by telling them that she would consider remarriage when her work was finished. But every night she undid what she had just completed. On the return of Odysseus, the suitors are slaughtered. Baird's project can be read as an elaborate re-casting of this myth. In Baird's work, infinitely patient labour somehow atones for death. Conceptual artists dedicate entire careers to making art which does not develop, and which has no phases. In such work, the seemingly absurd repetition of manual activity fulfills various artistic purposes. On Kawara makes a painting of the day's date in a meditation on the temporary nature of life, Buren (a frequent visitor to NSCAD while Baird was a student) uses the same stripes in installations in order to deconstruct the institution of art. 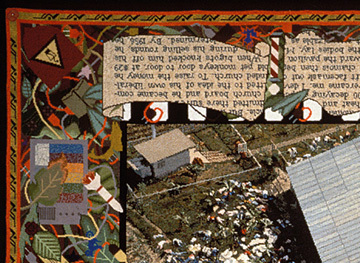 Significantly, The Jonestown Carpet was begun after the head of NSCAD's graduate program, Eric Cameron, began in 1979 to make his Thick Paintings (to be continued), in which a few ordinary objects are covered with layer upon layer of paint. (As of 1995, Cameron is still painting these same objects.) Baird's work fits into a special category of contemporary art in which constant artistic innovation is rejected in favour of an obsessive commitment to one work.